Tree related building subsidence occurs when shrinkable clay below foundations becomes dried out by tree roots. Cracks open up as the building loses support from the underlying clay and these progress through the summer. Cracks tend to close during the winter months when soil moisture is replenished. 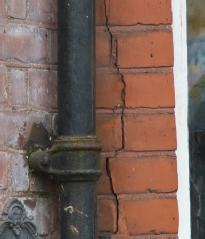 Martin Dobson Associates are often instructed by loss adjusters in the early stages of subsidence in order to determine whether trees are involved and if so what action should be taken to remove the influence of the offending vegetation. Instructions are also taken from private individuals who have been notified that their trees are causing damage to a neighbour’s property. Martin Dobson Associates represent both defendants and claimants where claims for tree root nuisance are made. Dr Martin Dobson presents a day training seminar together with Dr Giles Biddle for the Arboricultural Association entitled ‘Getting to Grips with Subsidence’. Cracking in this building occurred at the junction of the main front wall and front bay. A tree was located in the pavement to the front and was implicated as the cause through moisture withdrawal from the shrinkable clay below the shallow foundations.